Dermatologists are trained to treat patients of all ages, from newborns to the elderly. This includes the diagnosis, treatment, and prevention of problems of the skin, hair, and nails. Conditions common among children are moles and birthmarks, dermatitis, acne, warts, vitiligo, insect bites, and birth defects. In adults, we treat a range of conditions such as cancers and pre-cancers, rosacea, psoriasis, and shingles. We also treat eczema, allergies and other disorders that occur in all age groups, and carefully examine moles or other growths to determine whether they are or may become cancerous. 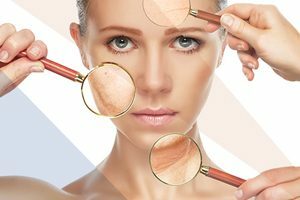 Acne is the term for the blocked pores (blackheads and whiteheads), pimples, and deeper lumps (cysts or nodules) that can appear typically on the face, neck, chest, back, shoulders and upper arms. Repeated exposure to sunlight, especially ultraviolet light, can cause a variety of cosmetic and medical problems in our skin. Skin cancer is the most common form of cancer in the United States and involves abnormal growths of skin cells that can form anywhere on the body, but most frequently appear on skin that is exposed to the sun. Sclerotherapy is a procedure used to treat spider veins by injecting a solution into the veins which causes them to gradually disappear. Phototherapy or light therapy involves exposing the skin to ultraviolet light on a regular basis and under medical supervision.